This system allows video and audio communication between you and other in your office or house. If it is installed between your workstation and the main entrance, this system could release the door’s EM lock by pressing a button with your finger. 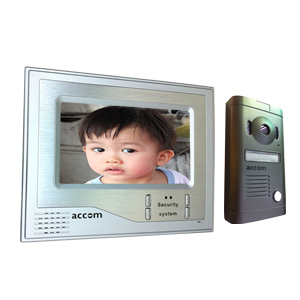 Now, our authorized dealers provide this Video Intercom System with inclusive of installation. This is valid for installation in the Klang Valley, Malaysia. 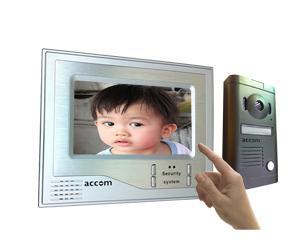 Video Intercom System + Installation + One-year Warranty. An EM Lock shall be installed by the client before the installation is conducted. A power point shall be installed beside the indoor unit by the client before the installation is conducted. The workmanship, requires one working day, Wiring, Installation and Training, will take place from 10:00 a.m. – 5:30 p.m. on agreed date (Mon - Sat, including selected public holidays). Adjustable Brightness, Chrome and Ring Volume. This intercom allows you to see the visitor while you talk to her/him, but, not wise-versa. Just press a button to open the door if you have an Electromagnetic Lock install on the door. Safety gurus provide consultation, installation, and system training to clear confusion and avoid future system overwrites by technologically stunted garden gnomes.